ANAHEIM, Calif. — Ben Lovejoy’s good luck charm hasn’t been in the world for more than a few days but her presence was still felt at the Honda Center Friday night. The Ducks’ defenseman scored two goals – both nearly identical shots – to help the lead the streaking Ducks over the Oilers, 5-2. After making the defensive play of the game in a win over the Sharks Tuesday only hours after the birth of his daughter, Lovejoy scored twice in under three minutes of the first period, recording the fastest two goals by an Anaheim defenseman in franchise history. Lila is the first child for Lovejoy and his wife Avery, but should his play continue like this, she may be far from the last. "We may have to keep pumping them out if I can keep scoring two goals a night," Lovejoy said. "It was an awesome first period for me and for our team. I was very lucky." Edmonton scored just 35 seconds into the game but Kyle Palmieri tied it up only 11 seconds later. 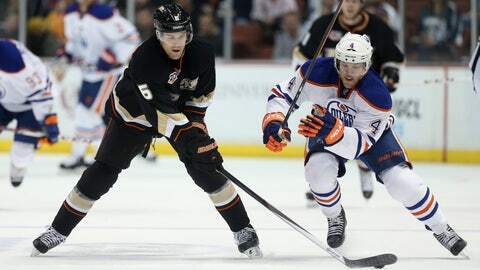 The first period then turned into a shootout when Nail Yakupov took a 2-1 Oilers lead and Lovejoy found the net twice. The first was a brutal slapshot off a beautiful feed from Saku Koivu. The second time, Cam Fowler set him up in the exact same spot just off the right circle and he slapped it in once again for his third goal of the season. "To get a second, very similar pass, it has to be perfectly in my wheelhouse," Lovejoy said. "And both (Koivu) and Fowler were able to find it. It’s a very small sweet spot." The miniscule sweet spot is why the hat trick was out of the question. Head coach Bruce Boudreau didn’t even look in Lovejoy’s direction when Edmonton pulled their goaltender for a stretch late in the game to give the Oilers a 6-on-3 advantage. Lovejoy joked that it was somewhat of a relief. "All I could have done there was mess it up," he said. "Bruce showed some highlights of a power play one time when we were playing the Red Wings and there was a clip where I was in the power play from last year. He gave me a warning and a heads up that might laugh during it." "I’ll be honest, I didn’t know they had a 6-on-3 until I counted six guys on the ice," Boudreau joked. "But Ben is playing so well, I don’t think goals and assists are going to be his determination." While a win over the lowly Oilers doesn’t look like much on paper, look at the big picture and it’s clear that Anaheim is a formidable contender. It remains the only team in the league that is unbeaten in regulation at home. With the win, the Ducks became only the third team in NHL history to start a season earning a point in 18 home games or more and it’s the longest streak in club history, besting the previous mark by four. The Ducks have now won 12 of their last 13 games; they stand just one point behind Western Conference leader Chicago with 65 and increased their Pacific Division lead to seven points. "We’re a good hockey team — a very good hockey team," said Tim Jackman. "The way we play is a testament to our leadership and out goaltending, obviously, but everybody is kind of buying in and believes in this."